Remember playing with the Rubix Cube as a kid? The 3D puzzle was invented in 1974 by Hungarian sculptor Ernő Rubik, but it wasn't until the 1980s that the toy was licensed and sold widely. Since then, some 350 million Rubix Cubes have been sold. That figure doesn't include the variations -- the 2x2, 4x4, and 5x5 cubes -- and the 3D puzzle knock-offs. Just last week, a Lego Robot solved a Rubix Cube in 5.35 seconds, fairly thrashing the previous record of 10.18 seconds for a robot to solve the Cube, and more importantly perhaps, besting the human world record of 5.66 seconds. 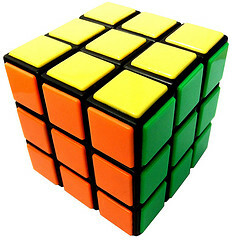 The Rubix Cube has long been sited as a tool to help develop problem-solving and spatial thinking, and the YouCanDotheCube.com offers lesson plans and activities (all matched to state standards) for teachers who want to use the Cube to visualize other aspects of the math curriculum -- fractions, geometry, algebra. There are also templates for classrooms to their Cubes to do things other than just "solve" them, including creating large mosaics (it takes 225 Rubix Cubes, according to one template, to recreate Lincoln's portrait). With or without a robust curriculum, there's still something pretty impressive about watching someone -- human or robot -- solve a Rubix Cube, particularly once they master how the Cube is put together and the steps that are necessary to put the pieces in the right place. Disclosure: YouCanDoTheCube.com sent me 2 Rubix Cubes and 2 solution guides. I still have the Rubix Cubes -- the kids in my household already had their own. But they took the solution guides and cackled as they did so. Now I'll never solve this darn thing, will I?